Phone stand made of the highest quality, durable aluminum and American handcrafted hardwood. Portable stand provides a comfortable viewing angle, not only for your apple watch, but also function as a fashionable stand for your phone and tablet. Provide you a perfect visual angle and reading with a comfortable sitting gesture. It's a great nightstand or desktop stand for you. The stand is ideal for iPhone X, iPhone 8 8plus, iPhone 7 7plus, iPhone 6s 6s plus, iPhone 6 6plus, iPhone 5 5c, iPad mini, iPad Air, iPad 1/2/3/4, iPad Pro, Kindel, Samsung S8 7 6, Sony xperia, Google Nexus, LG, HUAWEI, Otterbox or waterproof case on all the Android smart phone, Note/Samsung Galaxy Tab P5200 P5210 P5220 all the table PC users. 【STURDY】 3 in 1 stand (iWatch iPhone iPad) made of double thickening American handcraft hard wood and 4mm thickness solid aluminum alloy, which is 50% times thicker than normal stand. This might be the most solid stand you had ever tried. 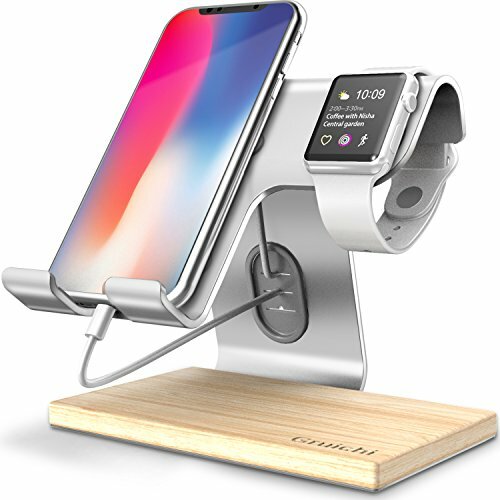 【COMPATIBILITY】 Aluminum desktop cell phone stand is universal perfectly compatible with apple watch for both 38mm and 42mm models, compatible with iPhone 6 6S 7 8 X Plus, all Android Smartohone, HUAWEI, Samsung Galaxy S7 S6 S8, iPad, e-readers and tablets (4-13 inch), Nintendo Switch. This stand fits all device, although smartphones and tablets with thick case ,such as Lifeproof and Otterbox. 【RUBBER PROTECT】 Rubber pads and feet of apple watch stand can protect your device from daily scratches and sliding. Desktop stand smart cable management makes everything organized. Especially, the rubber circle allows you to neatly organize your cables when charging devices. 【MULTIFUNCTION】 Hands-free, perfect 60° visual angle when using facebook, email, facetime and youtube, cook, easy to read message and play game. Best for nightstand, kitchen, dining-table, office, living room and other places. Cooling your device while charging. 【GUARANTEE】 Gruichi brand 180 days warranty. If you have any question, please contact us, we will fix it within 24 hours. If you have any questions about this product by Gruichi, contact us by completing and submitting the form below. If you are looking for a specif part number, please include it with your message. VICSEED Car Phone Holder Compatible iPhone X 8 7 6s 6 Plus, Samsung Galaxy S9 Plus S8 S7 S6 Note 8, LG etc.